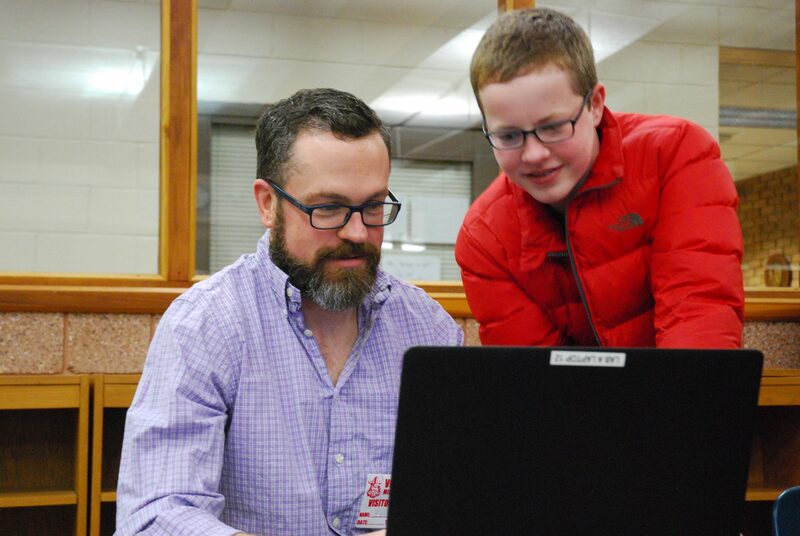 Bert Magladry plays a computer game made by his son, Finn, through a STEM course at Voorhees Middle School. Voorhees Middle School held its Enrichment Expo this past week in the Raymond Brosel Performing Arts Center for sixth- and seventh-grade students to showcase several projects they created over the past few months. On Tuesday, parents and students watched video creations the students made over the past several weeks using stop-motion animation technologies for music and STEM. “They developed a concept, wrote a script, created a storyboard and then animated the video in STEM,” said STEM teacher Christine Blizzard-Wrobel. Students used materials to bring to life scripts they worked on together in groups of at least three. After piecing together the video footage, they went to music class to work on another aspect of the projects. “They came to my class the next marking period and we added and timed music background, sound effects, dialogue and any other overlay over the video,” said Debra Volpe-Hines, music related arts teacher. Students used different programs to put the two projects together to create their videos, such as Garage Band. All together, it took about six weeks for the video portion of the projects to come together. Additionally, students also had the opportunity to work further with technology when in the classroom of Michael Canale, technology teacher at VMS. Students were tasked with the challenge of creating original games with a program called “Scratch” by MIT using blocks of code. Students worked for approximately three weeks on the project, and had the opportunity for their parents to test their games during the expo. Canale explained the multiple aspects students touched on throughout the process, such as working together to brainstorm ideas, but also create the games themselves and troubleshoot problems when something in the game might not go correctly. Bert Magladry, whose sixth-grade son Finn was one of many students to have created a video game through the course, says the technology being introduced to these children at such a young age is both impressive and shocking. “But it’s essential as we take a look at where we’re going in terms of workforce, artificial intelligence and these things continuing to develop. So I think these types of programs are absolutely essential,” Magladry added. Finn was able to create a game using the coding program where the user must keep a player away from objects that hurts him with the mouse while also traversing the screen for extra lives. Other students in the program creating various other games using the coding programs.